SPRING SALE 20% OFF! WOO HOO! 1st Floor - Beachfront Pool & More! FAM FAV! Beachside One condo rental 4011 - Sandestin Beach & Golf Resort is a two bedroom two bathroom direct beach front condo within the Sandestin Beach & Golf Resort in Destin, Florida. This family friendly vacation rental comes complete with all of the conveniences of home! Sandestin Beach & Golf Resort - Beachside Tower One condo rental 4011 in Destin, Florida is located six miles east of the heart of Destin with four championship golf courses, 15 tennis courts, a sports and spa clinic, biking trails throughout, many shops and restaurants including the new Baytowne Wharf shopping area overlooking the bay and the Hilton Hotel, and much more. * Spacious Patio & Green Space & Beach Dune View! This award-winning resort boasts amenities galore for a fun filled family friendly vacation. The resort is also the perfect location for a romantic beach getaway. Come see why Sandestin Beach Resort has been a favorite of beach goers across the nation for the last 20 years. FAMILY FRIENDLY RESTAURANTS - GALORE! SHOPPING - BEACH & OUTLET SHOPS TO EXPLORE! Panhandle Getaways offers over 500 vacation rentals along the Panhandle of Florida. Our vacation rentals along 30A, Destin, Ft. Walton Beach and Panama City Beach, Florida provide the perfect vacation spot for your next vacation. Panhandle Getaways features a variety of property types which allows us to offer something for everyone. Panhandle Getaways specialty is helping guests find the perfect vacation rental for them and being that we have been in business more than 25 years, one can be rest assured that Panhandle Getaways is a name you can trust. Beachside Towers within The Sandestin Beach & Golf Resort is a family friendly property boasting incredible amenities and a gorgeous beachfront in which to enjoy! This vacation home is one of the most popular units I have and I am blessed to have had the opportunity to share my home with all of the lovely families I have hosted through the years. 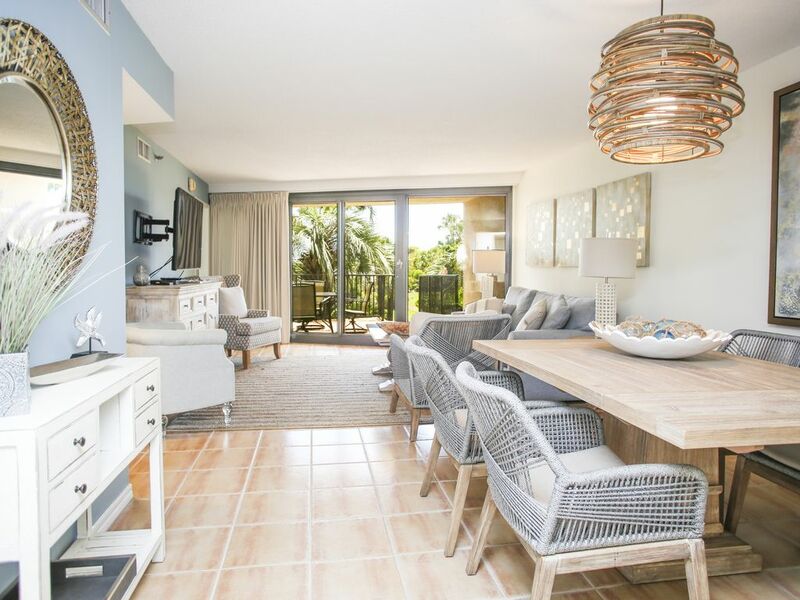 Beachside Tower One is located within Sandestin Beach Resort which is an expansive beachfront property with amazing amenities in which families enjoy. Four Golf Courses Within Sandestin Beach & Golf Resort. All towels provided with the exception of beach towels which we encourage you to bring for use at the beach and pool. Dining Area and Breakfast Bar provide ample seating for all in your party. Rentals available on the beach for an additional fee. Charters and rentals available via several companies in the area. 1st floor Patio with lush tropical landscaped grounds just steps to the pool and beach. Beachside One located within Sandestin Beach Resort has several golf courses on the grounds of the resort and is open for visitors to make tee times. This condo was in a great location. The bedrooms were nice and cozy. The washer/dryer combo needs replaced. Dryer takes hours to dry, washer sounds like it’s going to blow up. There were cockroaches 2 different times in smaller bedrooms bathroom. Called the maintenance number on the app to come treat the bathroom. Lady said someone from maintenance would reach out to me. We never heard back from anyone. Also, couch needs to be cleaned or replaced. Overall, good stay and convenient location. Thank you for taking the time to write us a review about your recent stay with us. We apologize in the delay of getting you the necessary information regarding your arrival and will look into that. We are so glad to hear that you enjoyed this property and your stay. We look forward to your return visit back to the beautiful beaches of Destin. Perfect! Beautiful condo, conveniently located on the first floor. Excellent location, easy access to pool and beach from first floor walkout. The condo is beautifully decorated and very spacious. I think this is perfect for families with young children. Tram service provided easy access to Baytown Wharf area. Perfect vacation! Thank you for your wonderful review! So glad to hear that you enjoyed the decor along with your vacation being perfect. Come see us again in the future! We loved the condo! Decorated nice and it was very clean. Just needs a few fix ups-freezer handle on frig door was loose. TV in master bedroom was not set right so the voice was off. The view is obstructed by a huge sand hill so you can’t see ocean from room. The WiFi worked perfectly! It was a great week with perfect weather! Thank you for your feedback! Glad you enjoyed your stay and hope to see you again in the future. It was nice to have such quick easy access to the beach, pool and parking. I wish the bathroom for the second bedroom.had the door replaced on the medicine cabinet instead of no door. That was a little eye sore. We did not have access to the kitchen supplies included. Maybe I missed that somewhere. Overall we really enjoyed ourselves and would stay at the property again. Thank you for your review we hope to see you again in the future. Condo was fabulous! Great updated condo with an amazing patio and lawn area close to the pool and the grills. We were able to allow the kids to run around and play while we grilled out and hung out on the patio. Condo had plenty of towels, but I would highly recommend you bring extra toilet paper and paper towels. They only negative was the kitchen was very lacking in some everyday essentials like pot holders & mixing bowls. If you plan on eating out every meal then you would be fine, but we cooked every night that we were there. Both beds were comfortable, but I will say the guest room had a much better mattress then the master and if you do not like down pillows bring your own! Also, be carful when taking a shower in the master the water leaks out onto the floor and not just a little, but a lot, I think because of the curved shower rod the curtain can not fully close at both ends. Definitely lay some extra towels on the floor. We would most definitely book this condo again! Thank you for your feedback! We are so glad you enjoyed the spacious balcony. Also the condo has been updated since your stay. Hope to see you in the future. Less than 1 mile from Baytowne Wharf...a pedestrian friendly marina, shopping village, restaurants and children activities. This resort is located six miles east of the heart of Destin with four championship golf courses, 15 tennis courts, a sports and spa clinic, biking trails throughout, many shops and restaurants including the new Baytowne Wharf shopping area overlooking the bay and the Hilton Hotel, and much more. Beautifully landscaped with security at all entrances, there is so much to do here including riding bikes and rollerblading.